Triggers can be defined as the database objects which perform some action for automatic execution whenever users try to do execute data modification commands (INSERT, DELETE and UPDATE) on the specified tables. Triggers are bound to specific tables. As per MSDN, triggers can be defined as the special kind of stored procedures. 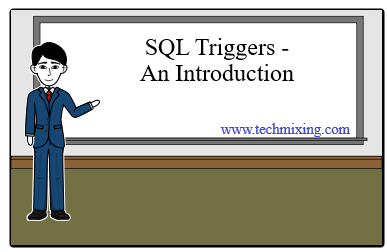 This article “SQL Triggers – An Introduction” will give you the detailed knowledge about the SQL Triggers which can be very helpful in your work. Before describing the types of triggers, we should first understand the Magic tables which are referenced in triggers and used for reuse. We can execute a stored procedure whenever we want with the help of the exec command, but a trigger can only be executed whenever an event (insert, delete and update) is fired on the table on which the trigger is defined. We can call a stored procedure from inside another stored procedure but we can’t directly call another trigger within a trigger. We can only achieve nesting of triggers in which action (insert, delete and update) defined within a trigger can initiate the execution of another trigger defined on the same table or different table. Stored procedures can be scheduled through a job to execute on a predefined time, but we can’t schedule a trigger. Stored procedure can take the input parameters, but we can’t pass the parameters as an input to a trigger. Stored procedures can return values but a trigger cannot return a value. We can use the Print commands inside the stored procedure to debug purpose but we can’t use the print command inside a trigger. We can use the transaction statements like begin transaction, commit transaction and rollback inside a stored procedure but we can’t use the transaction statements inside a trigger. We can call a stored procedure from front end (.asp files, .aspx files, .ascx files etc.) but we can’t call a trigger from these files. “After Triggers” are executed after the data modification action (Insert, Delete, Update) is executed on the respective tables. A table can have multiple triggers defined on it. This trigger will be fired, whenever a new Customer is added to the bank and the corresponding entry is inserted into the table Custmail. The mail functionality will use the entries from the table custmail to send the mail to the Customer. Suppose, there is an another requirement that whenever a customer is deleted from the system, mail is sent to the customer containing the notification about deletion.To sends the mail, we need to insert an entry of the customer in the table custmail, whenever a customer is deleted from the master table customer. To achieve this we will use the after trigger for deletion. In the example given below, we will use the magic table Deleted. Suppose, we have also a requirement that whenever a client credit his account or updated his name (first name as well as last name), a mail should be send to the customer containing this information. In this case, we can use the After trigger for update. In this example,we are going to use the Magic table Inserted. In the above example, we used the Update function on the columns amount, custfname and custEname which initiates the update trigger on modification of these columns. Instead of trigger is used when we want to perform another action instead of the action which causes the trigger to fire. Instead of trigger can be defined in case of Insert, Delete and Update. For example, suppose we have a condition that in a single transaction a user could not be able to debit more than $15000. We can use the Instead of trigger, to implement this constraint. If the user try to debit more than $15000 from his account at a time then error is raised with the message “Cannot Withdraw more than 15000 at a time”. In this example we use the magic table Inserted. 2) If we want to store the records of all the events, which change the database schema. For example, suppose we want to create a table command_log which will store all the user commands for creating tables (Create table) and commands which alter the tables. Also we don’t want any table to be dropped. Therefore if any drop table command is fired, a DDL trigger will rollback the command with a message that “You can’t drop a table”. For storing the create table command in the table command_log , we first need to create a trigger which will be fired in response to the execution of the Create table command. This trigger will be fired whenever any command for the table creation is fired and will insert the command into the table command_log and also print the message that “Table has been successfully created”. Suppose if we want to store the alter table commands also in the table command_log, we need to make a trigger for Alter_table command. To stop the user from dropping any table in the database, we need to create a trigger for drop table command. Nested Trigger: – In Sql Server, triggers are said to be nested when the action of one trigger initiates another trigger that may be on the same table or on the different table. For example, suppose there is a trigger t1 defined on the table tbl1 and there is another trigger t2 defined on the table tbl2, if the action of the trigger t1 initiates the trigger t2 then both the triggers are said to be nested. In SQL Server, triggers can be nested up to 32 levels. If the action of nested triggers results in an infinite loop, then after the 32 level, the trigger terminates. Since the triggers are executed within a transaction, therefore failure at any level of within nested triggers can cancel the entire transaction, and it result in total rollback. In SQL Server, we can have the recursive triggers where the action of a trigger can initiate itself again. In SQL Server, we have two types of recursion. In Direct recursion, action of a trigger initiates the trigger itself again which results in trigger calling itself recursively. In Indirect recursion, action on a trigger initiates another trigger and the execution of that trigger again calls the original trigger, and this happen recursively. Both the triggers can be on the same table or created on the different tables. Please note: Recursive trigger can only be possible when the recursive trigger option is set. Suppose we want to get the list of all the triggers and their respective tables name then we can use the following SQL Statement. 1. The user is added to the system. 2. Whenever any information regarding the user is updated or deleted or added. 3. A user is deleted. 1. The code is very old and unstructured. Therefore, it has many inline queries written on the various .aspx pages. 2. Queries for the insert, delete and update is also written in many stored procedures. So the code doesn’t have a common library function or a standard stored procedure which is used throughout the application which can be used to insert, update and delete a user, which is not a good practice. But it happen sometimes with the old code. The required queries are written on many .aspx pages and stored procedures. To complete this task, we need to insert an entry into the table tblmail with proper flags indicating the insert, delete and update. A scheduled application built in .net application will read the rows from the table tblmail and send the mails. 1. Find all the places in the .aspx files and the stored procedures where the queries for the insert, delete and update and after these queries, add the insert query for the table tblmail. 2. Instead of finding these queries in all the .axps files and stored procedures, create after (insert, update and delete) trigger on the user master table will insert the date in the table tblmail after the execution of the insert, update and delete statement. 1) It is very difficult to search so many .aspx files and stored procedures to find the required queries. 2) It has the risk that a new developer may not know about this requirement of sending mail and forget to add the code for inserting the values in the table tblmail. 3) If we need to change anything in the requirement, it has to be changed in all these files and stored procedures. 4) With the second approach, we only need to create triggers on the table and the developer, and it will also minimize the risk mention in the three 3 points mention above. 4) Sometimes if the code is not well-managed, then it can help in maintaining the database constraints defined on the tables on which the trigger is defined. For example, suppose if have a situation that there is an online learning system in which a user can register in the multiple course. Suppose the organization wants to define a constraint is defined that a user cannot be deleted until he/she passed all the course in which he is registered or the user has to first himself from all the incomplete or failed courses. Since the code is not well-managed and the code to delete the user is defined as the inline query in many .net pages and multiple stored procedures (this is not a good thing, but it happens), one has to write the code for enforcing this constraint in to all these .net files and stored procedures, which take so much time and if the new developer does not this constraint and forgets to include the constrain enforcing code which corrupt the database. In this case, we can defines an instead of trigger on the table which checks every time a user is deleted and if the condition of the above constraint is not met, display the error message instead of deleting user. Trigger is bad or good depends upon its use and its proper documentation. It can be very useful when it is used to maintain the integrity constraints in the database tables in the absence of primary key and foreign key, or it is very useful for the auditing purpose in tracking all the changes. But, if it is used extensively, it can reduce the performance. Also to maintain it and making debugging simple, proper documentation of the Triggers is necessary, which records the trigger name, table name on which it is created, its definition and its purpose. This is very nice post!!! As you alredy discussed disadvantages of trigger.One of the point I want to discuss with you,What happen when bulk Insert task happend on the table.I think as you describe above,it may slow down the performane of Sql server Database. Is there any alternate way to overcome this type of situation ? Thanks for your valuable comments. Triggers are used to maintains the data integrity of the tables of the tables and for the auditing purpose. So even if triggers slow down the performance, it is very helpful. Excellent article with cool example to understand and learn trigger. Wonderful article stated in simple easy-to-understand language. I have just begun to work on SSRS and completely fascinated by it. I wandered here in my free time. The article gripped my interest and I kept reading till the last line. My last 20 minutes have been effectively spent. I am bookmarking and coming back. It's really great that you take time to share your knowledge to the world.Keep sharing. Thanks Sagar for your valuable feedback. sir, if a trigger is Fired on insert,update and delete table then how many Magic tables are created? This is very good article. it helps me too much, what is the importance of trigger. but can you please wrote more regarding stored procedure. with examples. why we wan't to be used stored procedures? instead of select, insert queries. differance between varchar and nvarchar? Excellent article i great feel about u r post. Thanks Rohit.. hope you find my other articles helpful too.